The institute recognizes that the oral and written communications are an integral part of life of professional. Therefore, special emphases are laid on development of these skills of the students through classroom presentations/seminars and workshops on personality development. Further, the students are given specific topics by the faculties as a part of their tutorials. 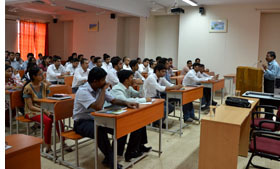 The students extensively use the computers to design classroom presentations and the same is made through wall mounted LCD projector.